Some ghost stories are a dime a dozen, if you will, but sometimes there are ghost stories that’ll stick with you. Infidel is simply horrifying in so many ways. The book uses it’s situations to point out racial issues. The white couple complaining about their Korean and Arabic neighbors to their other white neighbors. It was a strange paranoid scene that actually turn very terrible. Meanwhile our main character Aisha is in the hospital with her life on the line. Her childhood friend Medina has returned to the apartment to help her only to have further disaster happen. The local spectres are brutal and vicious to their victims. Their actions all lead to Medina being framed for the situation. Pichetscho puts Medina through some horrible times to get some resolve from this ghost story. Campbell’s illustrations are just simply scary. The ghosts are non-human and bloody sicking enough to give anyone nightmares. This story scares us and gives us room to pause about how we think about other people around us. This series will be a nice collection when bounded together. 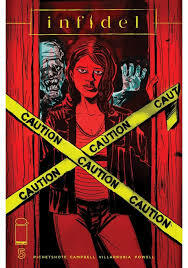 This fifth issue is a good finish to the series, but like any decent ghost story is leaves a back door for more.